Green Earth Hygiene’s products are manufactured by our Singapore based supplier. 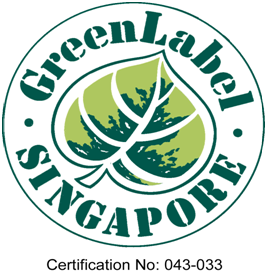 Many of our products are Singapore Green Label certified. The Singapore Green Labelling Scheme (SGLS), launched in May 1992 is administered by the Singapore Environmental Council (SEC). The SGLS is Singapore’s leading environmental standard and certification mark. The Green Label aims to help the public identify environment-friendly products that meet certain eco-standards specified by the scheme and seeks to encourage the level of eco-consumerism as well as to identify the growing demand for greener products in the market. SEC is a member of the Global Ecolabelling Network (GEN), an association of third-party, environmental performance recognition, certification and labelling organisations founded to improve, promote and develop the “ecolabelling” of products and services. SGLS has been successfully audited by the GEN as meeting ISO 14024 and ISO Guide 65 standards for the GENICES accreditation. Other country members of GEN include Good Environmental Choice, Australia Ltd and Environmental Choice, NZ who operate comparable labelling programs to SEC’s SGLS.